Accommodate guests in any space. The holidays are here so you may host some out of town guests. Holiday season calls for warmth and laughter and we can oftentimes agree that during impending celebrations the more really is the merrier. So whether you have enough bedrooms to accommodate everyone or not, we can certainly assist with some tips on maximizing space. Assuming privacy isn’t a prominent factor, any room in your home can be transformed to sleep more than a couple of people. Most guests crashing for the Holidays are typically content with simply having a soft place to lay their heads at the end of the day. Sofa beds, day beds, couches or sleeper chairs are good options for transforming a living room into a guest room. They can also create a suite that sleeps a family when adding to a bedroom with an already existing bed. Do your children have bunkbeds? If so, they too are great for guests and if not, it might be a good time switch out the standard twin for fun and space saving bunkbeds. You can read more about bunkbeds on Buddy’s Home Furnishings article, “Saving Space in Your Kids Room with Bunkbeds”. Other obvious options are laying out air mattresses. You can use the back of a couch to act as a headboard for an air mattress and you might even consider placing a side table or stack of books to act as a nightstand. Creating a private space out of an open space can make your guests feel welcomed and at home. You can also create multiple personal spaces out of an open room by using a folding screen or setting up a fabric curtain. Setting up an indoor tent can also create a private space and can be fun for kids and adults alike. 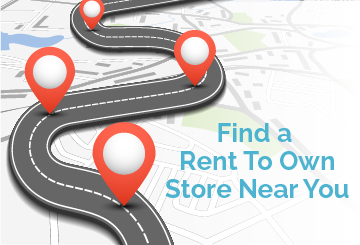 Shop RTO offers a rent to own store locator, let us help you find a store that offers affordable options near you so you can clear some space and embrace the holiday cheer. Just another Shop RTO Holiday tip.